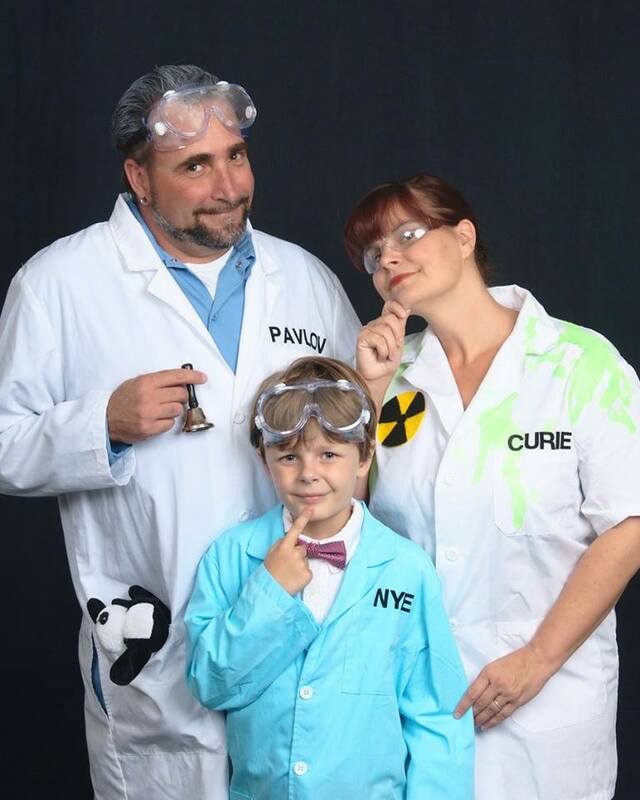 Raising Jedi | 5 Ways to Help Your Special Kid Love Halloween as Much as You Do! Our first attempt at trick or treating lasted for exactly two house visits. The first went on without incident. The second, however, ended our journey. I rang the doorbell and a nice lady answered with a bowl full of treats. So far so good, until my little Jedi saw that her living room contained not one, but THREE ceiling fans. He walked right in and started flapping his little arms as fast as they would go. As luck would have it, the residents were quite friendly. They invited us all in to watch the World Series and to crack open a beer. (Juice for the Jedi.) It wasn’t the Halloween that we had envisioned, but it wasn’t half bad. I simply LOVE Halloween. I love planning for Halloween. I love decorating for Halloween, but when it comes to the actual day, I have learned to manage my expectations. In that way, it is pretty much just like every other day as the parent of a kiddo on the spectrum. It can still be great. I thought that I would make a little list to help out possible first timers or those who have had a bad experience in the past. Let me preface this by saying that I sometimes see lists like these and get a little miffed. That usually happens because the advice is either totally obvious or would NEVER work for my kid. If you have something that works for you, but that is not part of this list, please mention it in the comments. We are all here to help each other, right? #1 Go on a reconnaissance mission! Trick or treating can be a minefield of motion activated meltdowns. Mom or dad, travel the entryway to heavily decorated houses first. For us, a jumping spider meant an ABRUPT end to the festivities. For sound sensitive kiddo, try bringing headphones. You could even incorporate them into the costume. Pilot? Or dare I say it… Princess Leia buns! Awww, yeah! These are events advertised as safe and fun alternatives to traditional trick or treating. They usually take place in a mall or shopping center. Some people love them. I am not a fan. In my experience, they can be a big sensory bomb. There are almost always lines, everyone yelling with great acoustics in the building, and huge crowds. Maybe if it is raining and a last resort, but even then I may end up being the one being carried to the car in full freak out mode. #3 Don’t get hung up on the perfect costume. It is really hard for me to take my own advice on this one. There is nothing that I like more than a perfectly posed Halloween picture with an awesome group costume. 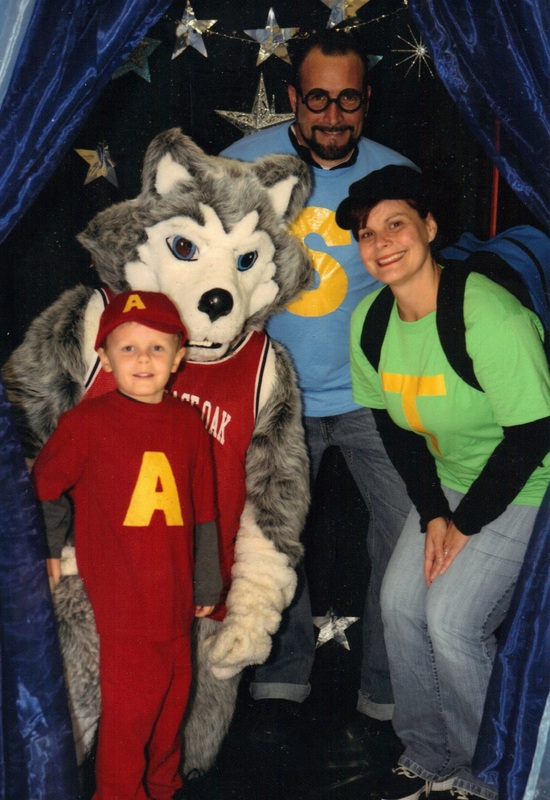 As you can see from all of these pictures, I torture both my child and my husband by taking all of the Halloween snapshots. However, if your kiddo is not comfortable in their costume, you may end up spending your evening chasing around the new neighborhood streaker instead. The best costume that I may have ever come up with was also the most comfy. Alvin and the Chipmunks. Sweats and t shirts. Boom! Done. Does it matter if your kid is dressed in pajamas, rain boots, a backwards cape, with a colander on his head? Anyone can be Spiderman, but he will be the cutest and happiest super/fisherman/pastafarian in town! #4 Don’t let dietary restrictions stop you. A lot of our kiddos have sensory aversions or dietary restrictions. We can work around this in a few ways. For instance, my child HATES chocolate. (He did NOT inherit this distaste from me.) We made a deal. He gets to trade in this chocolate bars for fruity candy. He is happy and I gain five pounds. We even have a local dentist who encourages kids to trade him candy for toys. I realize that both of these things require a child to have the ability to be able to see the reward ahead. That is not always possible, so we go back to reconnaissance. Visit a few of your neighbors before you go out, and drop off a goodie bag full of preferred items for them to pass on to your kiddo when he or she comes knocking. Most people are pretty cool with it. #5 Still not up for door to door? Start a new tradition. If trick or treating is still too much for your little spook there is still fun to be had. Maybe he can pass out the treats, be designated candy sorter, or paint pumpkins. If all of the bell ringing is too disturbing, turn off the porch light, build a couch tent, and watch Goosebumps or Charlie Brown. 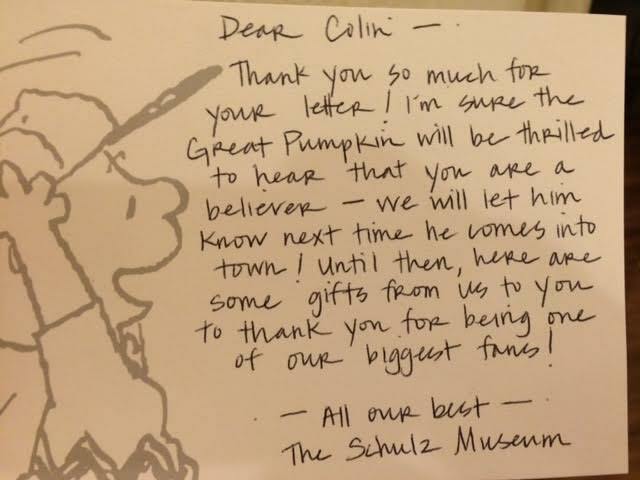 I hear that the Great Pumpkin loves getting letters this time of year. I hope that you, as a parent, find at least one of these ideas helpful. If not, don’t give up. Remember that we are nothing if not extremely adaptable people. It kills me to see articles titled, “Surviving the Holidays.” Let us not merely survive. Let is soak up all the joy that this crazy trip called parenthood has to offer. 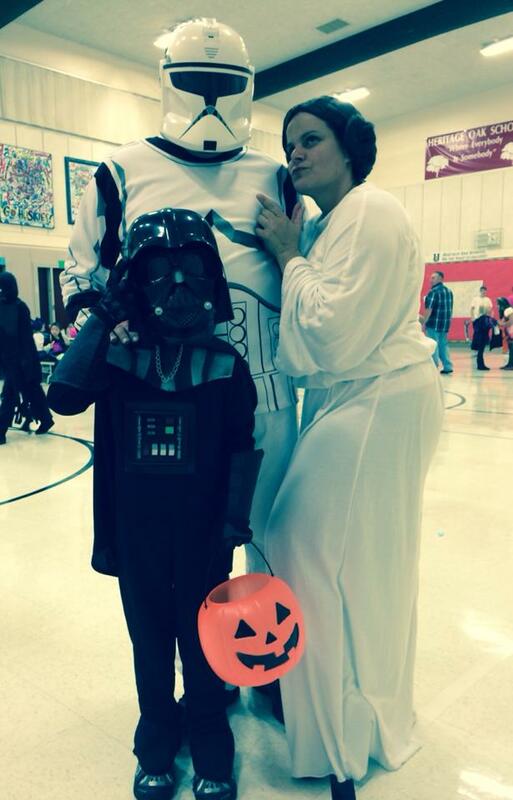 Have a great Halloween from your friends at RaisingJedi! 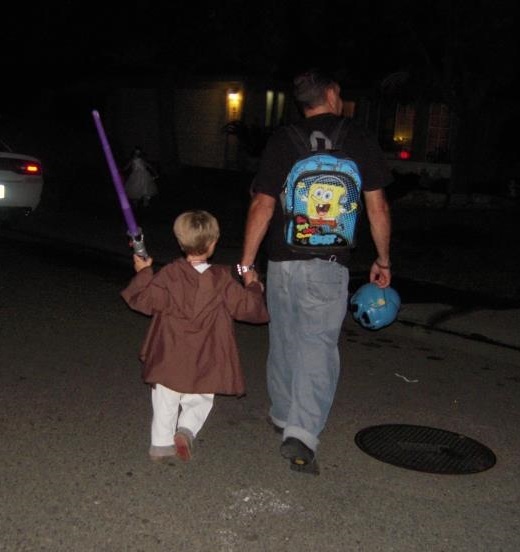 Tagged autism, halloween, jedi, parenting, special needs, trick or treat. Bookmark the permalink. Hello Peggy, great blog post! Would you be willing to share it with Autism Speaks? Please email me. Thank you! Great tips. I have found with my 1 kid who has sensory disorder that she was really freaked out by creepy decorations until I let her go to the store, hold & touch & pick out her own creepiest of creepy stuff & decorate our house. Once she was familiar with ours, when she recognized similar stuff at other houses it was less intimidating & overwhelming. It turned into “hey we have a giant moving spider too, it’s just like ours” also, letting her know that she could return home for a “break” without the threat of the entire evening being over, the fear of, ” if I freak out now it’s all done with” was gone & she was more relaxed knowing she could regroup & continue.